Long before the final copy-edit I had concluded that my first and unusual hybrid non-fiction book containing elements of genealogy, heir-hunting, and social and family history would not attract a main stream publisher. In any event I couldn’t face writing query letters, hustling publishing houses and receiving endless rejection letters. I decided to self-publish and retain control. But, it is often said that writing is the easy bit and that the route to publication is the hardest. Certainly there are numerous elements and I have expertise in none: typsetting, cover design, proof-reading, indexing, book marketing, print-on-demand, conversion to e-book formats etc. All the advice one reads about self-publishing is the absolute need to create a professional product: good cover, well typeset and free of punctuation and grammatical errors. Basically, it shouldn’t be sloppy. I had to decide what I could try to learn on the hoof and what I could never master to the level required to produce a professional product. I started with the book cover and mastered the art of layering and fading within Paint.net. I was even able to use one of my own photos which I had taken in Argentina in March. I was pleased with the result (see below) until I discovered that my image quality was not sufficient for a full size book cover. My saviour was the discovery of Chandler Book Design. Not only could they bring my cover design to life but they also offered a typesetting service and a conversion to ebook, two more areas which I knew I would not be able to master. 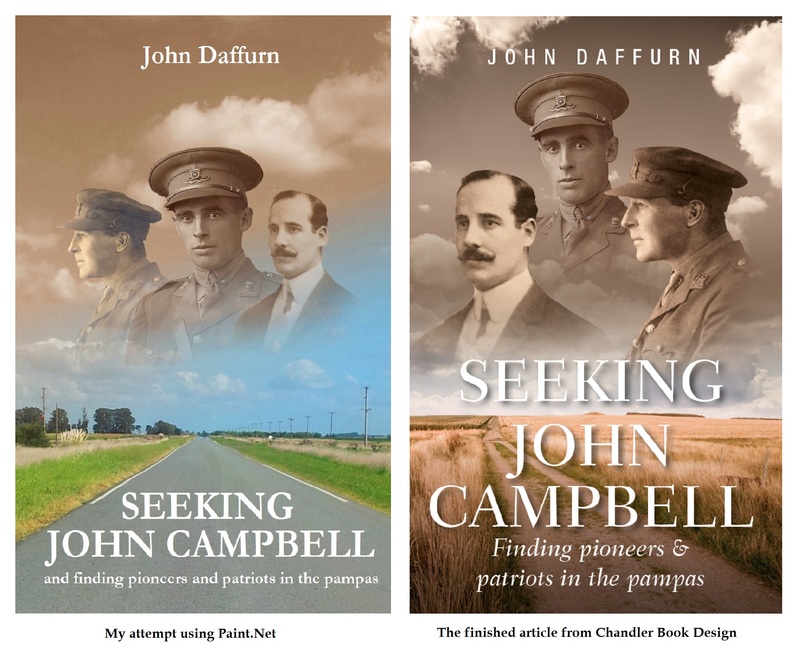 This entry was posted in Seeking John Campbell, preparing for publication and tagged Argentina, Chandler Book Design, genealogy, pampas, Seeking John Campbell. Bookmark the permalink.